I like ITIL. I use it quite a bit. But it puzzles me why ITIL is the default source of bestgood, generally accepted practice for IT processespractices. Often people talk as if it is the only source. 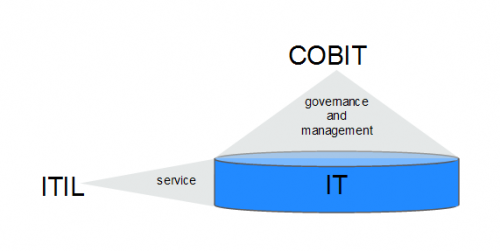 My default source of IT good practice is COBIT. It wins over ITIL, hands down.As a consultant, COBIT is my first-choice body of knowledge for my engagements. I go to it first to assess, to frame, to define, to justify, to audit. I turn to ITIL second, when I need more detail, or when I need the authority of the holy of holies to justify what I suggest. I presented this at the Pink Elephant 2012 conference, in a session called Showdown of the Methodologies. Coverage. According to “Aligning CobiT® 4.1, ITIL® V3 and ISO/IEC 27002 for Business Benefit” which was issued jointly by ISACA and OGC (co-written by the ITIL Refresh Chief Editor and reviewed by the ITIL Chief Architect), ITIL covers less than half of COBIT's range and only completely covers about a quarter of the practices (8 of the 34 COBIT processes) ...and that's COBIT 4.1. I bet COBIT 5 opens the gap even further. Rigour. ITIL is the Hitchhikers' Guide, COBIT is the Encyclopaedia . ITIL's narrative style (no really, compared to other frameworks it is downright chatty) may appeal, but as a foundation for my consulting activities the rigour and structure of COBIT is more dependable and useful. COBIT is systematically numbered; and every entity has a consistent structure. I actually find the formal COBIT structure much easier to use than the ITIL rambling: I find answers quicker, I get clearer concepts with less confusion, and I frame things readily. Benchmark. You can assess against COBIT; it has clearly defined requirements. That was one of COBIT's early drivers for adoption: auditing IT for SOx compliance. COBIT auditors/assessors are certified (CISA). To assess against ITIL you need to go to proprietary benchmarks (including TIPA, not to be confused with my Tipu). ISO20000 compliance is not the same thing as ITIL "compliance". Credibility. COBIT is written by a team, not a couple of authors per book. The same team for all the books. And then the list of all COBIT contributors and reviewers runs to pages. It is owned and published by a not-for-profit membership body set up and run by auditors, process geeks and security wonks. Its governance (and discretion) rocks. Unfortunately ISACA is American-centred but you can't have everything. Accessibility. COBIT is low cost (see below) compared to ITIL. There is a copyright and trademark waiver for use by consultants and vendors. You can subscribe to an interactive personalised online version (only COBIT 4.1 for now). Novelty. COBIT is of course not "new" any more than ITIL was when the world "discovered" it a decade ago. But COBIT has yet to be a fad, and the world is ready for a new fad as the realities of ITIL sink in. COBIT has none of the negative baggage accruing on ITIL. 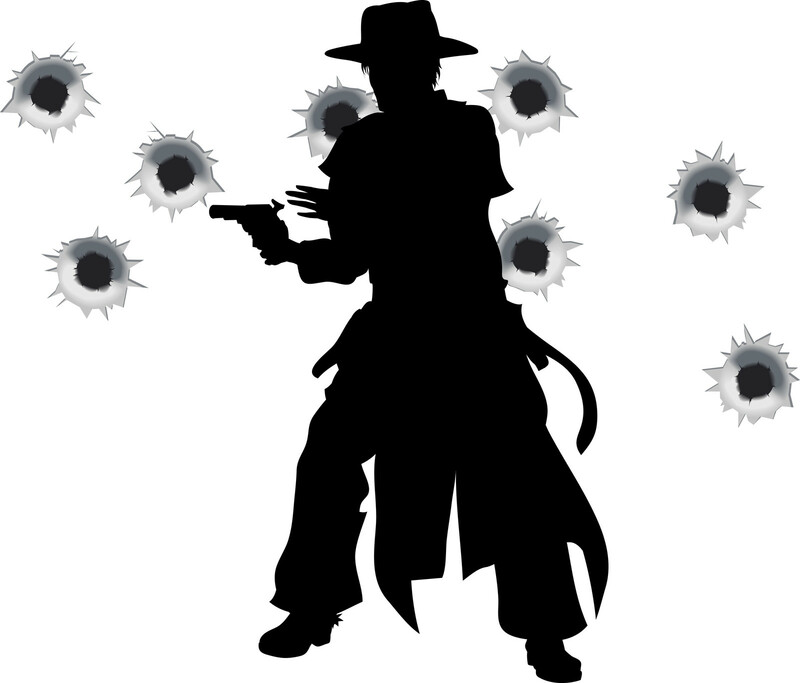 I think COBIT is IT's next silver bullet. Governance. COBIT will be embraced because the realisation is dawning that Cloud and SaaS and BYOD are business decisions not IT decisions, and that therefore it is high time the organisation as a whole stepped up to its responsibilities for IT instead of abdicating and blaming IT. Organisations have failed their IT like a bad parent, and the road to redemption is via better enterprise-level governance of IT, and that's what COBIT 5 is all about. ITIL V3 Service Strategy actually talks about governance quite a lot but nobody has read it. COBIT has the governance high ground. Yes the COBIT core is free... well close to it. ISACA want your email registration to get the main COBIT 5 overview but they don't want money. They want your ISACA membership fee (about $150 membership - varies by region) to get the remaining books in digital format for free, but personally I think that is a good deal, especially allowing for all the other benefits of membership. I pay it. I buy the hardcopy versions too at the heavily discounted members' price, but I'm like that: I still prefer paper to bytes. It is worth noting that what they give away for free in COBIT 5 is less than they gave away in COBIT 4.1. The free core in COBIT 4.1 is the equivalent of the COBIT 5: Enabling Process book and then some. Still, $250-odd buys you a lot of COBIT 5. Toolkit, a zipfile of articles, presentations and a spreadsheet. Where does ITIL win over COBIT? ITIL is much more a source of ideas and options, information, and explanation on why we do things. There is much more meat on ITIL. ITIL has a much larger user base, higher brand recognition, and more momentum. ITIL has an extensive certification scheme. I think too extensive, but some appreciate it. I suppose I must count the ITIL software compliance schemes, either the British Government one or PinkVerify, though I think they are both pretty pointless, but once again they give some people comfort. to justify: an authorative reference for IT "best practice"
Submitted by ianclayton on Fri, 2012-06-08 02:56. My first impression of the comparison and the information I've been able to review is that COPBIT still shares the same key failure points that caused me to label ITIL 2011 as Inside-Out. One day the framework evangelists will have the epiphany I see happening day after day in client organizations that the job of IT today is to engage its customers immediately and constantly and to think and act with the customer's interests in mind at the outset - thats what is termed thinking outside-ion. The danger of both of these framework is that in the wrong hands they will encourage and support a process/service/maturity approach that fails the customer because its inside-out. As others have indicated, comparing these against each other is inte4resting but to what purpose. What would help would be for the industry to agree on a set of overriding principles for service management that could be used to assess these and any other frameworks based upon the imagined role of IT today in the 'age of the customer'. Submitted by skeptic on Wed, 2012-05-16 23:55. Same topic, even same scope, but ITIL is skewed by its service perspective into emphasising some areas and de-emphasising others. Submitted by KJ (not verified) on Fri, 2012-05-18 00:48. I agree, COBIT is about Governance & Control, ITIL is about Service Management. There is space for both in one organisation and ISACA enabled this by incorporating ITIL (and Val-IT) concepts in the latest version of COBIT 5. Submitted by scott whitten (not verified) on Thu, 2012-05-17 00:36. Very interesting.... in your opinion where does ISO and CMMI lay on this diagram? Im working on real this. Submitted by skeptic on Thu, 2012-05-17 01:04. I've never mapped CMMI-SVC in detail but I'm assuming it has the biases as ITIL: service-centric. ISO20000 certainly does. Submitted by deaf-llama on Mon, 2012-05-14 16:56. A great post, Rob, and I agree with your viewpoint entirely. IT-CMF V1.0 June 2010. It has big players like BP, Chevron, AXA, Ernst and Young, Northrup Grumman, Microsoft, Google etc. Visit Maynooth, 15km west of Dublin on Mon 3 June 2012 to attend a free IVI Summer Summit conference. I'm attending. Submitted by skeptic on Mon, 2012-05-14 19:13. Oh good. That's what IT needs, another framework. We did discuss CMF on this blog a while ago. Submitted by deaf-llama on Mon, 2012-05-14 17:06. Submitted by Adam Holtby (not verified) on Fri, 2012-05-11 14:58. From what I have read thus far, I am very much liking the Cobit approach. It's focus, and consistent reference to the cultural and behavioural aspects involved in new implementations and change for example, makes for some good reading. The reformed process capability model is also welcome. Although it asks more of a process in terms of attributes required to reach a given maturity level, it will hopefully be embraced by adopters as a means of further enhancing the efficiency of their processes and associated value. I am with Claire on the "Not the only game in town" comment, but welcome Cobit 5's foundation of encouraging an enterprise-wide perspective. Submitted by Claire Agutter (not verified) on Fri, 2012-05-11 10:15. I love the description of ITIL as 'chatty'. Great article (as usual) - both ITIL and COBIT need to remember they aren't the only game in town and keep reassessing the value they are delivering. Submitted by skeptic on Fri, 2012-05-11 12:04. If COBIT gets hoisted onto the shoulders of IT and carried along like a conquering hero - as ITIL was - I don't doubt it will go to COBIT's head just as it did with ITIL. Submitted by aroos on Fri, 2012-05-11 08:00. AP001 manage management Needs no explanation, where is govern government? Submitted by skeptic on Fri, 2012-05-11 09:43. I think we'll have as much fun unpicking COBIT 5 as we did ITIL 3. I have changed my mind several times on IT strategy. i think there is such a thing, but it has to be an integrated subset of overall strategy, not standalone.